I like flavoured coffees, I have selection of syrups at home such as vanilla and caramel. We can usually find gingerbread lattes at christmas but Starbucks have gone an exciting step further forward with their new creation for Valentines. The new drink is a Pistachio and Rose Mocha, which sounds like quite a complicated set of flavours. The drink isn’t openly available to all yet, you need to have downloaded the app, and be in the know, in order to try it early. I ordered my drink, and paid using the app, but when she called my drinks she said; “hot chocolate and… err… the other flavoured mocha” which made me smile, and made me feel like I was in a secret club. I’m easily amused. It launches properly on Valentine's Day. 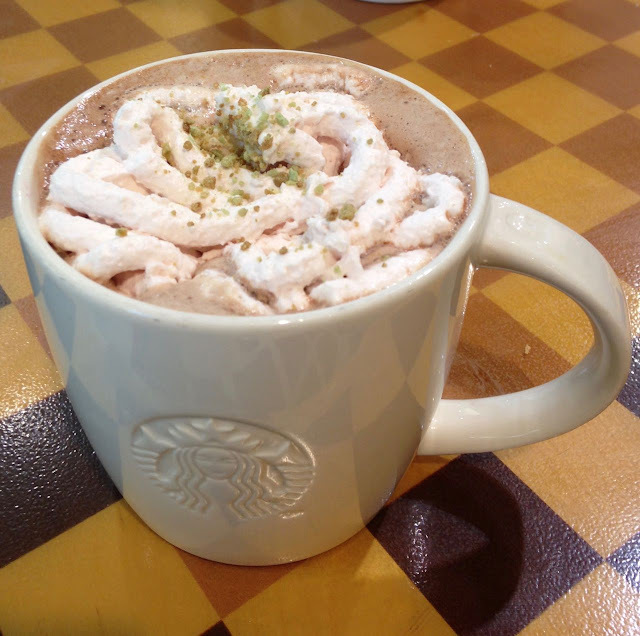 The drink is a mocha which is half hot chocolate and half coffee, in this is mixed a Pistachio and Rose syrup, it is then served with a swirl of pale pink rose scented cream with chopped green pistachio nuts sprinkled on top. The drink looked pretty, with its delicate pastel colours topping the flavoured mocha. I gave it a bit of a taste test and discovered that the mix of flavours came together nicely. I started by tasting the cream on top of the drink, and it had a slight hint of sweet rose, but a gentle flavour. The nuts on top were firm but not hard and the addition of the nutty taste was very pleasant. The rose in the syrup, combined with the chocolate in the Mocha and gave the drink an air of Turkish Delight, the floral rose and sweet chocolate being the highlight of the drink. The aftertaste reminded me frangipane, which I think is because of the combination of sweetened nut in the syrup. I enjoyed the drink far more than I expected too, and I would happily have another. Somehow all of those ingredients have nice complex tastes that complement each other well. The only negative element of the drink was that the pistachio bits from the topping. Some of them ended up in the drink as the cream melted, and that meant some sips ended up withs a bitty pistachio piece. My advice is to spoon these off and eat with the cream before you begin. If you want to try the new drink before its Valentine’s day launch, ask nicely in your local Starbucks. It is certainly worth it for Turkish Delight fans. This sounds really interesting! Nice to see a bit of an alternative new drink at Starbucks. May have to give it a go!